Spinach and Pancetta Thin Crust Pizza- Foodie Friday! - THE OLIVE BLOGGER - Recipes your family will love! 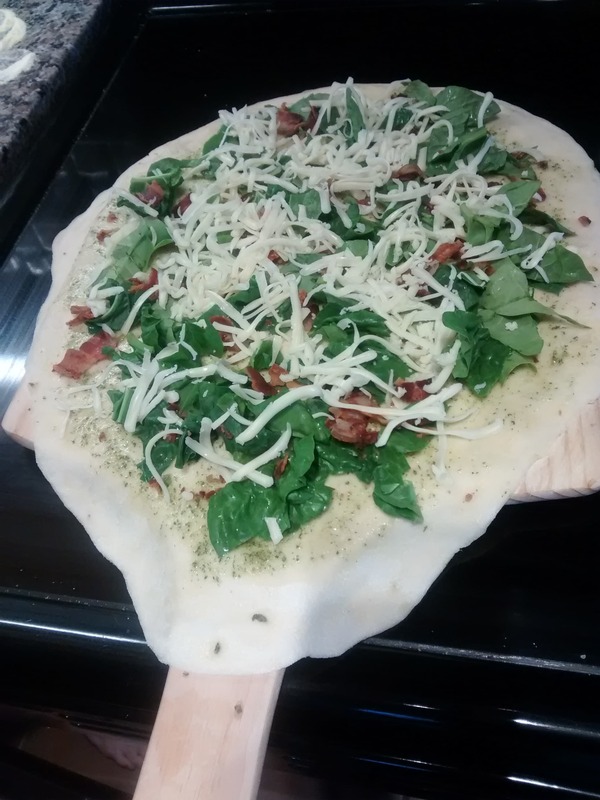 Spinach and Pancetta Thin Crust Pizza- Foodie Friday! This post may contain affiliate links, which cost nothing and allow you to see the products I use in my own kitchen! See my Disclosure Policy for full details. After seeing the response ya’ll had to my Homemade Pizza Dough recipe I thought that I would show you another great idea for topping it off! There are so many great ways to customize a pizza to your tastes and likes, and for my family, this is one of our favorites! I mean really who DOESN’T love pancetta incorporated into their dinner?? And to top it all off, we added in some spinach and yummy mozzarella cheese too…I know, I know, you are drooling and ready to get going right? Spinach and Pancetta Pesto Pizza Recipe with a Homemade Pizza Dough! A quick and easy weeknight meal for your family to enjoy! Before I get into the recipe though, there are few things that you need to know when making a pizza at home. First of all, be creative, every single time! Make it your own and have fun! It is really a great meal to get the kiddos involved in too, they will love rolling out the dough and topping it with their own veggies, meat and cheeses. Set out bowls with predetermined toppings and have them lined up on the table so they can dig in and create. Let them have fun and encourage them to build a healthy meal at the same time! You are also going to need some key tools and ingredients in your kitchen at all times if you plan on making pizza! A good Pizza Stone , you must have this for making pizzas…it really does make the difference between a good pizza and a GREAT pizza! The key to using your stone is to always leave it in your oven as this will help to season it(we keep ours foiled when not in use so it doesn’t get stained from other dishes we cook during the week). When you are ready to make your pizza you just uncover it and turn the oven on to preheat with it inside, this prevents it from cracking and makes sure it is really hot before your dough goes on…which gives you a delicious crust everytime! A Pizza Peel , yep this is another mandatory for making your pizza. And I know you are thinking, “But aren’t those things like 4 feet long?! Where will I fit it? !” well let me tell you that no they are not all that big! We have the perfect size wooden pizza peel that fits into the same cupboard as our cutting boards! Corn Meal . I cannot stress to you enough how MANDATORY this ingredient is for making your pizza! If you love the crunchy texture that your delivery pizzas have, this is your secret ingredient…and trust me it makes a major difference! When stretching out your dough you combine corn meal with a little bit of flour and work right on top. You also sprinkle a light amount on your pizza stone right before plopping your pizza on! I promise you, this is the one step you do not want to skip! Okay, one more thing before the recipe! For this pizza I used a pesto base, I found it really went with the flavour combination I was working with. Now, if your family prefers red sauce, by all means use that instead! For my pesto I used Epicures Lemon Basil Aioli seasoning mix (sells for about $7 and lasts forever!) we actually use it on fish, chicken and veggies when getting them ready for the grill too! All I did was take 2 tbsp of the mix and whisk it with 1/4c olive oil and 1tsp lemon juice, I then used a silicone brush to spread it on the base of my dough before adding my toppings. Pesto see how I made mine on the site! Here is that yummy pizza ready to go in the oven, assembled on the pizza peel. Doesn’t this look incredible!? You can see the crunchy thin crust, combined with the melting cheese and wilted spinach…get eating! And that friends is your newest recipe to add to your pizza collection! Be sure to check out my Kale Pizza for more inspiration! Ohh this looks so good! Friday in pizza night in this house and I am definitely going to add this into the rotation. Thanks for sharing! You are welcome Meaghan!! I hope it becomes a new family favorite for you guys!!! Always nice to have a few pizza recipes in your recipe box! Thanks Marisa! It is so easy to make and the crunchiness is so nice! Enjoy! That’s the kind of pizza that I find myself eating WAY too much of (it’s got a nice thin crust though, so it doesn’t count, right? Right?). I didn’t know about corn meal in the crust! What a great tip – thank you! Thin crust is only 1/4 of the “regular” crust…:) should only count for that in calories!!! The cornmeal makes such a difference in the crust, you will notice it for sure! Love pancetta and no guilt with all that spinach! Great idea for pizza night. I always throw in a little treat on our pizza, healthy is good but you need to balance it out to make it fun! Enjoy! This looks AMAZING! I only eat thin crust and love to be able to put spinach on my pizza. Can’t wait to try, thanks! Thanks Mandy I hope you enjoy it as much as we do!! This looks delicious and is something I am definitely going to try in the near future. It looks so healthy, meaning I won’t feel as guilty devouring the entire thing. Thank you for sharing! It looks amazinggggg! Is a pizza peel the wooden thing you put it on? Thanks Francesca!! Yes the peel is the wooden spatula(ish) thing 🙂 But much larger in size! It is a MUST for making pizza on a stone!! So easy and delicious, and making your own dough is so much more cost effective than store bought! Pizza is one of my obsessions!!! And I love thin crust pizza!!! I´m definitely making this for the weekend! It looks so yummy!!!!! At home pizza is the best. Growing up we had a pizza stone and used it often. The pizza stone has really made a difference in our pizza game!